This little wooden box was bought at an estate sale with well worn quarters and pennies that emerged from a pink polka dot wallet with a pony on the front that belonged to a certain little girl who "really" wanted to buy it. 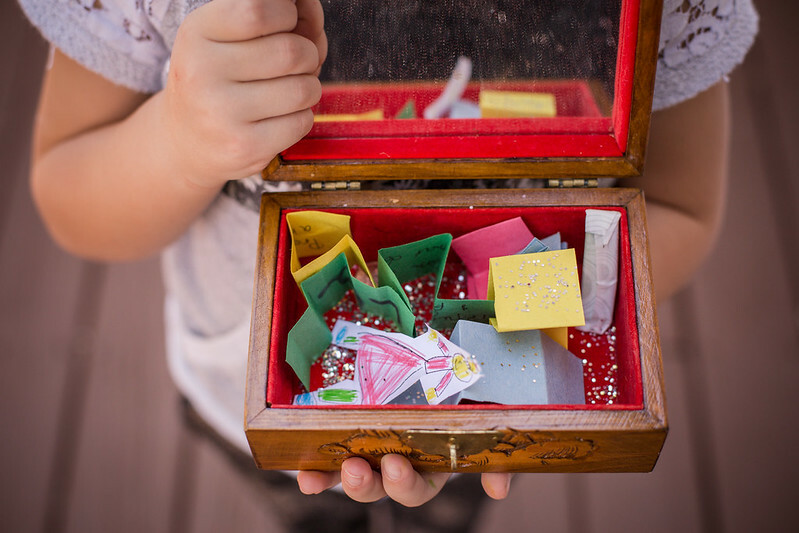 I noticed over the next few weeks that Evangeline would put slips of paper, little jewels, and drawings in the box. "What do you put in your special box Evy?" "Mama, it is my treasure box for Jesus. I put all things for Jesus in there and prayers and pictures for Him. And sometimes candy for Him." These special little treasures are just for Jesus. My heart is heavy friends. I am putting things in Evy's box today and asking Jesus to be so present because the darkness feels too much some days. I'm putting Noah's precious life in the box as he prepares to see Jesus face and to face and all of us are in there too as we try to hold this joy and grief together in one heart. I am putting the hearts and minds of our family; his Mom and Dad and little sister that are being asked to walk the most difficult of roads but are doing it with grace and holding desperately to truth. I am asking Him for grace, wisdom, and an abundance of love as we have welcomed a little girl into our family for a time. As long as she is here she is family but this transition is painful for us all in different ways. I putting her heart and mind in the treasure box for Jesus- it has always been there but I am advocating for her and reminding her she is loved and safe. And I am again putting our family in the box because too often I seek to control and fix when I should wait and watch and hope. I'm putting the brokenness of the system that seems overwhelming in the box. I'm putting fractured families and struggles and lots I do not understand in there too. I'm putting my own brokenness that is always highlighted and most evident when I am struggling. I am praying for mercy on millions of Syrian refugees fleeing for their lives and asking Him how do we respond. How do we "welcome the stranger" as we are commanded to do? I'm putting their individual and collective voices, stories, and lives in the box. I'm putting our friends that are preparing to celebrate Eid on an island so far away in the box. We are also putting glitter in the box today because of ALL THE GOODNESS and PRAISE we need to give to Him who is in it all. Our burdens are shared and can be transformed into joy because we do not walk in this journey of life alone. Today after school the crew of kids at our house each put something in the box too. Jesus' treasure box is full- it holds hardships and pain and hope and joy. And bubble gum because who does not like bubble gum? I am reminded that often without darkness we cannot appreciate and seek the Light. Big gooey tears over here, for Noah's family and yours and others, and even ours with our "little" (relatively, in this season) sorrows and aches. I sing "He's Got the Whole World in His Hands" to Pia at night because I need the reminder. Love you. I love Evy's treasure box for Jesus. She is so precious, and this special box is an outward sign of her heart. So cool to be able to symbolically put our hopes and cares into the Jesus box so we know He holds them for us.